Hit the open road with your Awesome Deluxe Camper. Cruising around the scenic highways and backroads of Australia are one of the best ways to see this country! With a vehicle built for two, this can be the perfect way for you and your travel buddy to see the land down under. There is nothing better than seeing all the ins and outs as you make your way from place to place, seeing our wildlife and landscapes for yourself! The Toyota Estima also has power steering, a dual battery, and a power supply of 12volt & 240Volt. It has ABS and air conditioning and heating in the driver's cabin. For your entertainment it also has a radio and CD player, and for your safety, it is equipped with airbags. Your camper will not only provide you with wheels to get you around, but it's also a place to spend the night, prepare your meals, and call your home! You will have everything you need for your upcoming road trip - we'll provide dishes, linens, a kitchen, a bed and more. Ask us about the best way to spend your upcoming road trip. Please note drivers must be 21 years of age. 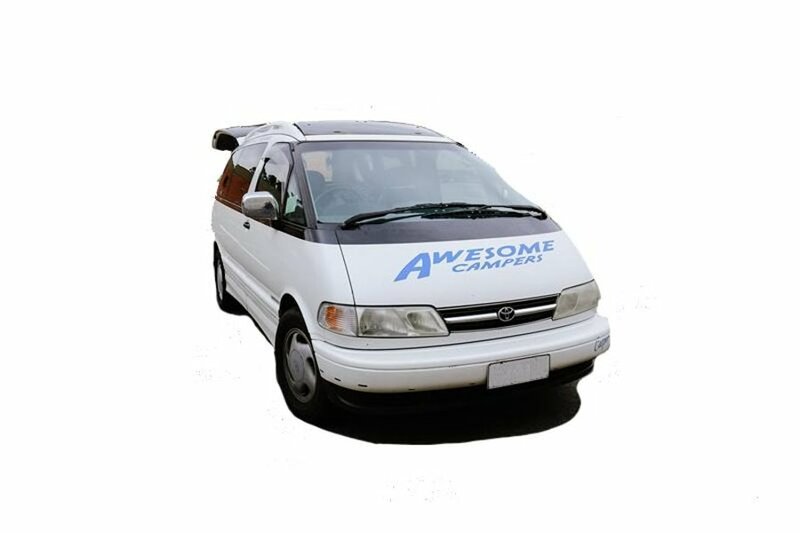 There is a minimum rental period for Awesome Campers. Please check terms and conditions. Ask your agent for an up-to-date quote. Rental days are calculated on a calendar day basis. When calculating the number of days the Vehicle is rented, the day of pick-up is counted as day one of the rental, regardless of pick-up time. The day of the Vehicle's return is counted as the final day of the rental regardless of drop-off time.Extensions may be organized through the sales office, subject to availability, and at the current rental rate. The extra cost of an extended rental must be paid by credit card on confirmation of the rental extension.Failure to obtain an authorization for a rental extension will result in a late fee of AU$100.00 per day in addition to the daily rental rate for each day until the Vehicle is returned. The daily rental rate charged will be the rate applicable on the day of extension per Vehicle for the extended rental period. Vehicle pick-up or return outside of branch hours are subject to an after-hours fee of AU$100. Awesome Campers have two-wheel drive vehicles. Therefore, they are not allowed to travel on unsealed roads such as dirt, gravel, fire trails, beaches, sand tracks, off roading or 4x4 trails. Please note there are prohibited areas where you cannot drive Awesome Campers (such as Fraser Island). The vehicle must be returned clean and with a full tank, or the renter may be charged a fee by the rental company upon returning. There are also additional fees associated with Awesome Campers, including 1 way fees. These vary depending on your departure and final destination. Please ask your travel expert for an up-to-date quote. Please select the date you would like to travel, and we will contact you with availability and pricing options.